After having the best comeback of 2019 by joining Drake on stage after a short stint away, J Hus has returned with a brand-new Daily Duppy freestyle. It’s been a while since we’ve heard from J Hus, apart from hearing his feature on Dave’s number one album, and the anticipation has been high for a new release. 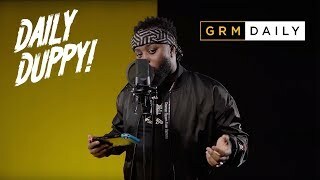 Well, the Bouff Daddy is back, hungrier than ever, and has decided to unveil a brand-new Daily Duppy freestyle; although it was recorded before he went away. In this new freestyle, J Hus gets real personal whilst remaining aloof. The rapper touches on his own trials and tribulations, mentioning the sad loss of his father, and his bail. Also, he mentions great leaders, with pictures of the late great Nipsey Hussle, showing what level of leadership he aspires to achieve. The instrumental that laces the freestyle is smooth and enticing, creating a perfect backdrop to allow Hus’ flows and lyrical ability to shine brightly. Now that we have Hus back, and eager to continue succeeding, this means that we’ll have even more new music from him soon. Are you excited? Check out J Hus’ latest Daily Duppy freestyle in the video above, and share your thoughts with us on Twitter.